Riggle was born in Louisville, Kentucky, the son of Sandra and Robert Allen Riggle, who worked in insurance. His family moved to Overland Park, Kansas, when he was two. He attended Shawnee Mission South High School, where he was involved in the school's radio and TV stations. He was voted the most humorous in high school and graduated in 1988. Riggle later attended the University of Kansas, where he was a member of the Phi Gamma Delta fraternity, attained his pilot's license, and in 1992, graduated with a B.A. in Theater and Film. He went on to earn a Master of Public Administration degree from Webster University in 1997. Riggle joined the Marines in 1990 after getting his pilot's license, intending to become a Naval Aviator, but left flight school in order to pursue his comedy career. 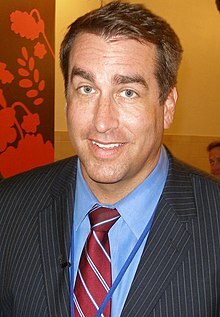 Riggle was a member of the United States Marine Corps Reserve and often referred to his military experiences on The Daily Show, including acting as the show's "Military Analyst" and publicly joking that he could kill any other member of the show. In August 2007, Riggle went to Iraq to report for The Daily Show as well as to entertain the troops under the purview of the USO. Riggle was a public affairs officer with a New York City based unit, and served in Liberia, Kosovo, Albania, and Afghanistan. He attained the rank of lieutenant colonel and was a recipient of: the Meritorious Service Medal (2); Navy and Marine Corps Commendation Medal; Joint Service Achievement Medal; Navy and Marine Corps Achievement Medal (2); Combat Action Ribbon; National Defense Service Medal (2); Kosovo Campaign Medal; Afghanistan Campaign Medal; Global War on Terrorism Service Medal; Humanitarian Service Medal; Armed Forces Reserve Medal; and NATO Medal. On January 1, 2013, Riggle retired from the Marine Corps Reserve after 23 years of service. He has a long-standing comedic partnership with comedian Rob Huebel with whom he frequently works with at the Upright Citizens Brigade Theater (UCBT) and in their former improvisational sketch comedy troupe Respecto Montalban. Perhaps the duo's best known creation was their long running two-man show Kung Fu Grip which they often performed at UCBT and other comedy venues for many years. The show was one of the featured acts in the 2004 HBO Comedy Arts Festival. Around this time they began appearing together in several of Comedy Central and VH1's talking head commentary programs such as Best Week Ever and A2Z. They also appeared in Bravo network's 100 Scariest Movie Moments special in 2004. These appearances got the duo their first mainstream exposure to television viewers. The two were instant fan favorites among regular viewers of the VH1 commentary programs. Riggle, Huebel and most of their fellow castmates from Respecto Montalban also performed regularly in comedic sketches on Late Night with Conan O'Brien throughout the late 1990s and early 2000s (decade). The duo's growing popularity landed them an audition on Saturday Night Live in the summer of 2004. They auditioned together, though only Riggle ended up making the cut. After spending one season on Saturday Night Live from 2004 to 2005, Riggle soon joined Huebel and many of his other Respecto Montalban castmates in Los Angeles to work on new projects. Soon after, the two landed a holding deal at NBC in early 2006 to develop a new half-hour comedy program for the network, though nothing has come of it since then. In September 2006, Riggle joined The Daily Show as a regular correspondent. Around the same time Huebel (along with Respecto Montalban member Paul Scheer and stand-up comic Aziz Ansari) started developing Human Giant, a sketch show for MTV. Riggle would often appear in the program's various sketches, as well as in the show's 24-hour live marathon which aired on MTV in May 2007. One of Riggle's most memorable guest appearances was as hired muscle, Ham-Bone, who appeared alongside Aziz Ansari in the season one sketch "Clell Tickle: Indie Marketing Guru". Riggle and Huebel can also be seen performing a sketch together on stage at the UCBT in Doug Benson's documentary Super High Me. A featured player during the 2004–2005 season, his first appearance as a cast member was on the show's thirtieth-season premiere on October 2, 2004. He has portrayed Larry the Cable Guy, Howard Dean, Rick Sanchez, Mark McGwire, and Toby Keith, and had a one-shot character named Leviticus, a loud, violent street preacher who only appeared on a Weekend Update segment on the Christmas episode hosted by Robert De Niro (another sketch featuring Leviticus was scheduled to air on the episode hosted by Hilary Swank, but that sketch was cut after dress rehearsal). Prior to being hired as a cast member, Riggle also appeared in a non-speaking role in the previous season (season 29) in a pre-taped parody of Fear Factor. Riggle played the father of one of the child contestants during the "Breakfast in Bed" challenge in which a child must eat the maggots off a plate of Eggs Benedict or his parents will divorce. In September 2006, he joined the cast of The Daily Show to replace the departing Rob Corddry. Riggle made his debut on The Daily Show on September 20, 2006. One piece that TV Guide regarded as his signature segment "Marines in Berkeley", a segment in which he dressed in hippie regalia to spoof University of California, Berkeley peace activists protesting a local Marines recruiting station. During the 2008 Olympics, Riggle traveled to China to tape sketches for The Daily Show, producing a four-part special feature titled "Rob Riggle: Chasing the Dragon." On August 3, 2010, Riggle made a surprise cameo on The Daily Show during an interview with Will Ferrell. While Ferrell and Stewart began discussing Riggle's "lack of talent" and making other disparaging remarks about him, Riggle suddenly walked onto the set to surprise them and asks if they were talking about him. Riggle's intimidating presence appears to make Ferrell and Stewart visibly afraid, continuing the running joke that Stewart is very afraid of Riggle. Previously, Riggle's live comedy work was mostly improvisational and sketch based, but beginning in 2006 he wanted to try something different and decided to work on creating a stand-up comedy act. After working on his act in various comedy clubs throughout New York City, he later began touring colleges and other local comedy clubs, often performing in stand-up shows with John Oliver and other writers from The Daily Show. Riggle credits John Oliver for first encouraging him to try stand-up while they shared an office together at The Daily Show. Riggle hosted an episode of Comedy Central's stand-up series Live at Gotham on December 4, 2009. He also taped a Comedy Central Presents special that aired on March 5, 2010. Riggle played the character of Eddie Reynolds in Blackballed: The Bobby Dukes Story, a 2004 film starring Rob Corddry as the lead character, and featuring almost all of the Respecto Montalban group. Later that year Riggle was one of the "Flab Four" on the Comedy Central mini-series Straight Plan for the Gay Man, a parody of Queer Eye for the Straight Guy that ran for three episodes. In late 2007, Riggle began appearing as a spokesman in a series of Budweiser commercials. The year 2008 saw Riggle sign a talent holding contract with CBS and CBS Paramount Network TV, which includes a development deal to create and star in a half-hour comedy series. In addition he gained a supporting role in Step Brothers, in which he plays a rude co-worker of Brennan (Will Ferrell). He had memorable supporting roles in the 2009 films The Hangover and The Goods: Live Hard, Sell Hard. Riggle also had supporting roles in the 2010 comedies Going the Distance, Killers, and The Other Guys. For the 2010–2011 NFL football season, Riggle recorded a Monday Night Football introduction and several short comedy bits for the Kansas City Chiefs to be played at Arrowhead Stadium in Kansas City, Missouri. Riggle played the lead in 2011 CBS sitcom pilot Home Game, executive produced by Mark Wahlberg. Riggle is seen in stadium monitors at Qwest Field during Seattle Seahawks games encouraging fans to cheer. In May 2011, Riggle appeared in a 2-minute short on funnyordie.com as the U.S. Navy SEAL who killed Osama bin Laden. Riggle plays a humble US Navy Lieutenant (though the insignia on his uniform displays three solid gold bands, indicating the O-5 rank of (USN) Commander) who, upon being awarded the Distinguished Service Cross, pledges absolute discretion—only to get intoxicated at a local bar and boast unreservedly to a large crowd that he was bin Laden's assailant. From 2011 to 2013, Riggle has co-starred as "The President of the Navy" in the Adult Swim comedy-action series NTSF:SD:SUV::. In April 2012, Riggle was announced as the upcoming host of the 2012 ESPY Awards on ESPN. The show aired on July 11, 2012. In 2012, Riggle had a recurring role as "Kevin Jesquire", in season two of the FX comedy series Wilfred. In October 2013, Riggle played the role of Satan in the music video for Steel Panther's "Party Like Tomorrow is the End of the World". In 2014, Riggle was expected to star with Rob Lowe in the pilot for the single-camera comedy The Pro as Bobby Welch, a former professional tennis player. As of 2016, the comedy pilot has yet to be picked up for a series by NBC. Riggle appeared as Frank West in the 2015 film Dead Rising: Watchtower. From September 2016, Riggle took over the role of Colonel Sanders in the KFC ad campaigns, replacing other comedians who had portrayed Colonel Sanders including Norm Macdonald and Darrell Hammond. Beginning with the 19th-season premiere of the Fox NFL Sunday pre-game show on September 9, 2012, Riggle took over the comedy skit and prognosticator portions of the show previously performed by Frank Caliendo from 2003 to 2011. Riggle married Tiffany Riggle in 2000. They have two children. High Road James Malone Sr.
2011 30 Rock Reggie Episode: "I Heart Connecticut"
2011 Happy Endings Drew Episode: "Full Court Dress"
2012 Victorious Vice Principal Dickers Episode: "The Breakfast Bunch"
2014 Bad Judge Chet Episode: "Judge and Jury"
2015 Key and Peele Ron's boss Episode: "Hollywood Sequel Doctor"
2015 Playing House Buck Finch Episode: "Knotty Pine"
2015 Fresh Off the Boat Gator Dan Episode: "Family Business Trip"
2016 Teachers Don Larondasack Episode: "Picture Day"
2016 Wander Over Yonder Bill (voice) Episode: "The Family Reunion/The Rival"
2016 Lip Sync Battle Himself Episode: "Rob Riggle vs. Jeff Dye"
2017 The Simpsons Dr. Fenton Pooltoy (voice) Episode: "A Father's Watch"
2017 Bob's Burgers Austin (voice) Episode: "Into the Mild"
2018 Big Hero 6: The Series Greg Jack (voice) Episode: "The Impatient Patient"
2018 The Epic Tales of Captain Underpants Theodore "Ted" Murdsly (voice) Episode: "Captain Underpants and the Flustering Mindless Woe of the Memory Wip"
2018 Fancy Nancy Doug Clancy (voice) Episode: "La Danse of Friendship/School La La"
2019 Brooklyn Nine-Nine Rob Dulubnik Episode: "A Tale of Two Bandits"
^ a b c d e Gutierrez, Lisa (February 1, 2013). "Rob Riggle is one of Hollywood's – and football's – funniest personalities". The Kansas City Star. Retrieved November 5, 2014. ^ a b Stangler, McKay (2007-03-05). "Sh*ts and Riggles". lawrence.com. Retrieved 2009-05-31. ^ "Kansans of the Year: Rob Riggle". Topeka Capital-Journal. 2008-12-28. Archived from the original on 2011-08-05. Retrieved 2009-05-31. ^ "Portrait & Profile: LtCol Rob Riggle". Portrait and Profile. Marines Magazine. December 14, 2009. pp. 12–13. Retrieved 1 April 2010. ^ "Bush's New Plan". The Daily Show. New York. 2007-01-11. Comedy Central. Retrieved 2017-01-26. ^ ""Operation Silent Thunder: 'The Daily Show' in Iraq" Nightly Reports Filed from Senior War Correspondent Rob Riggle Airing the Week of August 20 at 11:00 P.M. ET/PT" (Press release). Comedy Central. 2007-08-17. Retrieved 2017-01-26. ^ "Military Gig Is No Joke For 'Daily Show' Funnyman". NPR. 2009-05-24. Retrieved 2009-11-28. ^ Dufour, Tia (March 5, 2014). "Assistant Commandant of the Marine Corps, Gen. John M. Paxton, Jr., poses for photo with retired Lt. Col. Robert Riggle Jr". Assistant Commandant of the Marine Corps Photo Gallery. Washington, DC. ^ Canales, Angel (31 May 2013). "Lt. Col. Rob Riggle at Ease as Comedic Actor". ABC News. Retrieved 10 April 2015. ^ Bauder, David (2008-08-10). "Rob Riggle's off the hook in China". AP. ^ "August 3, 2010 - Daily Show: Will Ferrell". The Daily Show. 2010-08-03. Retrieved 2012-03-22. ^ "Rob Riggle and his new beard guest-star on Monday's 'Chuck' episode". Whosnews.usaweekend.com. 2010-11-12. Archived from the original on 2010-11-28. Retrieved 2012-03-22. ^ Schneider, Michael (2008-10-19). "'Daily Show's' Riggle moves to CBS". Variety. Retrieved 2009-11-28. ^ "The Navy Seal Who Killed Osama Bin Laden from Owen Burke". Retrieved 7 October 2018. ^ "Rob Riggle To Star In Rob Lowe's NBC Comedy Pilot 'The Pro'". Deadline Hollywood. February 7, 2014. Retrieved September 25, 2014. ^ "Riggle, Morenstein, Tracey and Paunovich to Lead Dead Rising: Watchtower". comingsoon.net. October 20, 2014. Retrieved October 21, 2014. ^ "KFC Debuts a New Colonel For Football Season". Retrieved 7 October 2018. ^ "Rob Riggle set to replace Frank Caliendo on Fox NFL pregame". USA Today. 2012-08-27. Retrieved 2012-09-23. 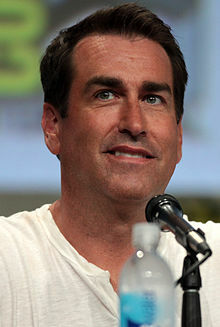 Wikimedia Commons has media related to Rob Riggle. This page was last edited on 24 March 2019, at 20:02 (UTC).